As shown below, occasionally when you import data from another system into Excel, the data you want is surrounded by quotes (“). 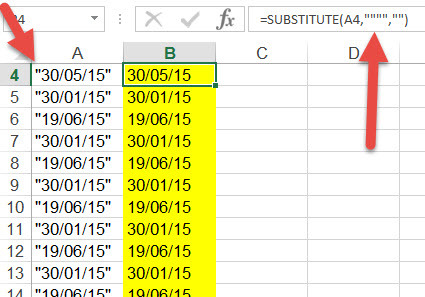 If you try to Find/ Replace them or use a SUBSTITUTE or similar formula to get rid of them it doesn’t work. This is because you need to use a special trick when replacing quotes in Excel. As shown above, even though you want to replace a single quote at a time, you need to put double quotes between the double quotes, i.e. to replace a single quote you actually need 4 quotes in a row.